“ I don’t know what to do with my living space”, was the cry I heard on the other end of the phone. This project had an unusual floor plan. As you entered through the month of chi, life’s journey/career, indicated by pictures 1 &2. the room opened up into one big rectangular space, with an extension in the upper right hand corner. 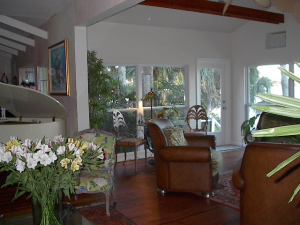 The room had no walls to separate foyer, living room, den and music area. The chi had no place to settle, and felt very scattered and quick moving. 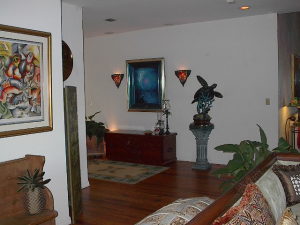 My design intent, was to create balance and integrate the space so a feeling of wholeness became evident. The open environment layout would be planned to include a foyer, sitting area, music area and overall connectivity. Correct Placement for manipulating the chi was very high on my agenda. It was also important to create pathways and focal points in each space. An overlay of the bagua was used for determining the more prominent areas of placement. In addition, the off white sofa was used as a foundational piece to establish a designated music area. A beautiful, white, baby grand piano became the portable focal point. The smooth, wavy, hood lines of the baby grand piano added a lovely yin yang rhythm and equilibrium to the atmosphere. Incorporating a glass top cocktail table and French provincial chairs, confirmed the elemental balance and created a sense of community. 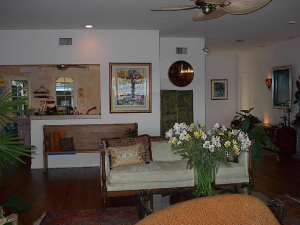 As seen in picture #4, a reading and TV space was also assimilated into this all-embracing environment. A 4ft. pathway was incorporated between the music vignette and the TV room. Two large, earthy, brown leather chairs were used as introductory anchors for this glass enclosed area. 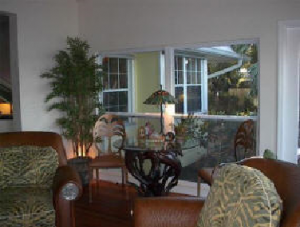 The angle of the chairs softened the invitation into the TV area. The angling of the chairs, created a comfortable pathway directly to the television and library-station. A feeling of trust and comfort was created.